This article describes a free data recovery software named Bitwar Data Recovery to recover deleted files. In daily life, data loss can happen with anyone at any time. Cautious users always back up important data. Because the best and easy way to fight against any data loss is backup. So, if something goes wrong and valuable files are lost, we can easily get them back. However, sometimes backup itself not enough to recover lost or deleted data because the backup files can't updated data themselves, or someone often forget to backup. When it comes to data safety, you can never be 100% sure that your data is protected and safe from any kind of loss or situation. There is always something unexpected that can happen. Whatever, after lost the important file, the first thing comes to your mind is how to recover it. As is known to all, you can restore the deleted data from Recycle Bin. But if unfortunately you have emptied Recycle Bin, the system doesn't offer the restore function itself to help recover lost files no matter from hard drive or external hard drive, in addition, system operation error or virus attack is another big element that cause data loss. In fact, you can recover the data back if you have a best free Data Recovery Software. Why? When a file is deleted from your computer, its contents won't be destroyed immediately. But its file directory disappears and the data hides from your eye then. What's more, its space will be marked as free for use. At this moment, you can recover it and get back the file back easily. But if you continue to use the device, the lost data may be overwritten by some new data and you may lose them permanently. Hence, if your data have been accidentally deleted, don't be panic. I recommend you a powerful full version data recovery software i.e. Bitwar data recovery. 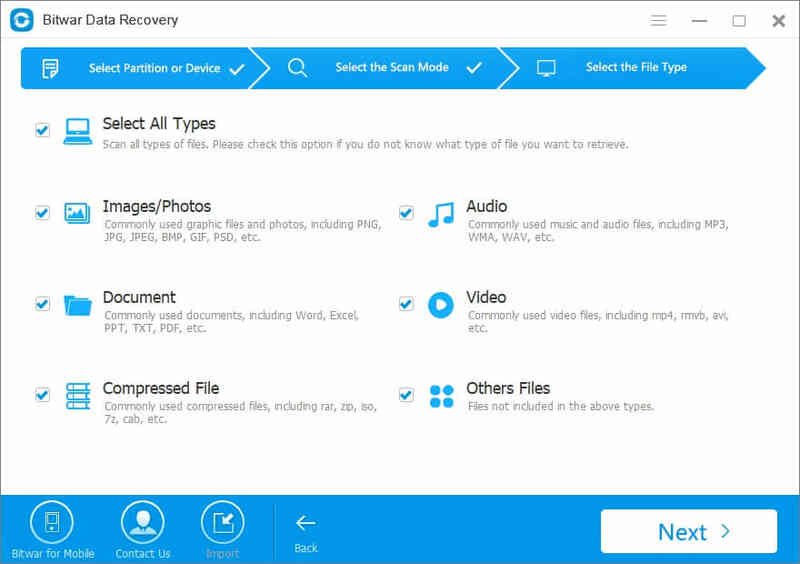 You can download this free trial data recovery software by clicking on "Free Download" button below. Bitwar Data Recovery is a free, reliable, fast and powerful data recovery software that can recover deleted files even if emptied from Recycle Bin, deleted or lost partition, formatted hard drive, RAW hard drive, inaccessible or corrupted hard drive, etc. Free download and install Bitwar Data Recovery Software in your computer by clicking the download icon below. Please remember don't save any data to the partition which files deleted. Step 1: Launch Bitwar Data Recovery and select your partition or device where the data deleted from, then click "Next". If you want to recover data from external storage device, you'd better connect it to your computer and then select it on this step. Step 3. Choose the exact file types and then click on "Scan" to start scan the eligible data. Step 4. After a scan, you can make a selection with preview before recovery to determine which one you want. Then choose the data and click "Recover" button to save them to other partition. Previous：The APFS Volume Locked by Mac, How to Recover Data? Next：How to Fix ＂The Disk Structure is Corrupted and Unreadable＂ Error without Losing Data? Summary：This page will share my own experience about how to fix “drive not accessible, the disk structure is corrupted and unreadable” error without losing data in Windows to you.